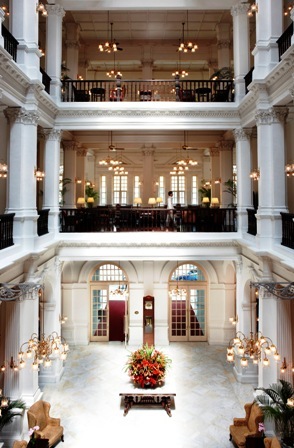 Known as the ‘Grand Lady of the East’ and described in 1889 by the Straits Times as, ‘one of the largest and handsomest hotels in the East’ the Raffles Hotel Singapore is still regarded as one of the finest hotels in Asia, if not the world. The hotel has seen many notable figures through its doors; Somerset Maugham, Joseph Conrad, Rudyard Kipling, Ernest Hemmingway and Alfred Hitchcock. More recently celebrity guests have included Michael Jackson and King Faisal of Saudi Arabia. It is truly a one of a kind place, which is synonymous with the highest quality service and luxury. 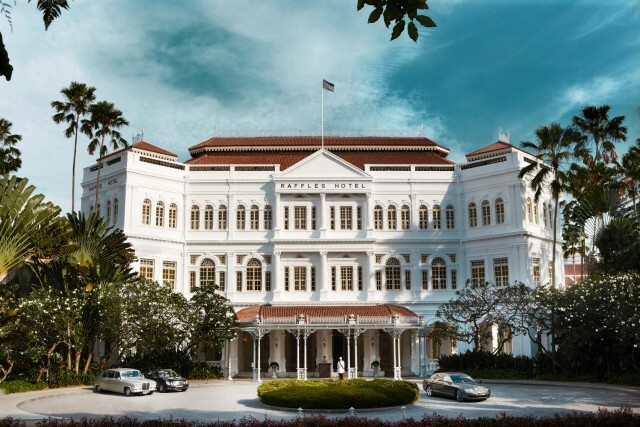 The hotel takes its name from Sir Thomas Stanford Raffles, who founded the modern city of Singapore on 6 February 1819 whilst working for the East India Company to further British influence in the area against the Dutch. Raffles, also famed for the founding of London Zoo was a keen naturalist and researcher who compiled masses of scientific materials of the Malay area. His legacy lives on with strong links to Singapore; giving his name to the lighthouse, Singapore’s University, Business Class on Singapore Airlines and with a statue immortalising him at Raffles’ Landing Site. The Raffles Hotel was established in 1887, the same year as the Stanford Raffles’ statue was unveiled by the Armenian Sarkies brothers. They redeveloped the former boarding school along with esteemed architect R.A.J Bidwell, giving it its current majestic appearance. When completed in 1899, the Raffles Hotel was state of the art for the time, with its electric lighting and ceiling fans being a first in Asia. The hotel quickly grew in popularity and became a centre of social events and the hotel continues to hold the New Year Fancy Dress Ball, as it has done since 1911. It further gained notoriety in 1902 as the site of the killing of the last tiger in Singapore and for the invention of the Singapore Sling cocktail by bartender Ngiam Tong Boon. The Long Bar in which the gin and brandy based drink was conceived still exists today and is a favourite spot for tourist wishing to relax with the iconic drink. Although thought to be impenetrable, Singapore fell to the invading Japanese army on 15 February 1942 during World War Two in what Winston Churchill described as, â€˜the worst disaster and largest capitulation in British history’. It is rumoured that British guests were found dancing a final waltz in the hotel when the Japanese invaders arrived. 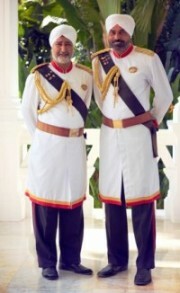 The hotel’s staff were more prepared for the invasion than their guests and buried the silverware in the Palm Court, from where it was recovered after the war. The Raffles Hotel Grill continues to serve from the saved silver beef wagon to this day, bringing its rich history quite literally, straight to your plate. The historical mystique of the hotel is further added to by it having a resident historian for the last 40 years. 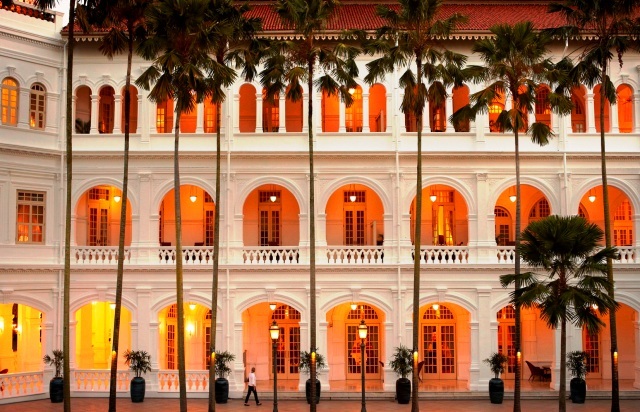 The Raffles Singapore Hotel is truly unique and a worthy ‘once in a lifetime‘ experience which is steeped in history and which operates along traditional high standards of service. It is one of the only places in the world where there is an opportunity to experience the Golden Age of Travel and sample the luxurious pleasure of bygone colonial living. 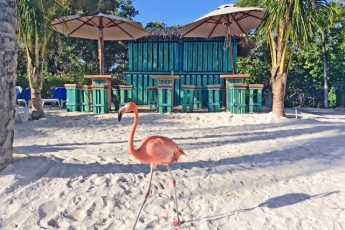 This article was written by Gara Gharagozlou, Managing Director of luxury holiday operator Mirus Journeys who is an expert in finding the most exclusive and elegant places to stay from across the globe. Wow – the hotel looks so beautiful. Singapore is one of my around the world stop offs, so this would be totally luxury stay. 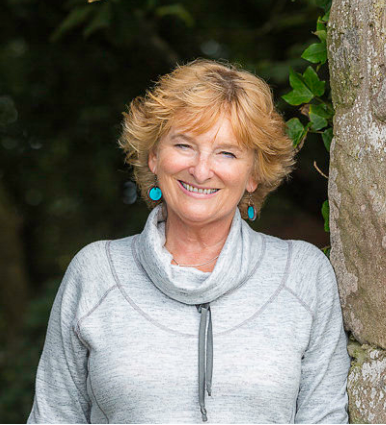 Definitely recommend it Sandra – and if you can’t manage a stay then at least drop into the Long Bar for a Singapore Sling! Cool dudes on the door!